Waste… and just lazy behaviour? The recent BBC programme “Hugh’s War on Waste” with Hugh Fearnley-Whittingstall that aired recently highlighting the problems of food waste was a fascinating look into how we have become. I recognised so many traits of people I know that will buy excessive food and then have to throw it out or they will only buy perfectly formed produce because they have become so conditioned. Do not get me started on Organic and the such like! I always remember once going through my mothers store cupboard and finding jars of jam, tins of food etc that were years out of date. She was of the “war rationing” generation that horded food and just hated waste. We have cultural differences as well – we see people in our French village going out each day buying the produce and food they need for that day. I have had a chef training and I feel I am pretty good at ensuring I use every bit of produce I buy and I like to also think I am pretty canny with my purchasing and try to buy what is in season. Local is good but can for me also be limiting… e.g. I love a Barbary Duck Breast so will purchase when I am in France and import or source an Asian ingredient I require when a local cannot be substituted. 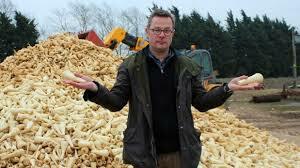 Hugh’s programme highlighted the public’s so called desire for perfect fruit and veg with tonnes of parsnips being rejected by supermarkets as they were marked with small blemishes or were the wrong sizes! Madness and irresponsible for all parties involved. Intermarche the French supermarket chain actually have a cheaper section of Fruit and Veg that are seconds or misshapen. It requires the public to demand their produce is not sanitized to the extent it currently is. What is worse is this “Best Before Date” people now think if it is gone beyond this it is dangerous and should be thrown. I was also equally annoyed by the way people stored their opened produce in the fridge in the same packets and unwrapped – open to cross contamination and spoiling. plastic bags as an invaluable piece of kit for me as I freeze or wrap gluts in bags till they get used. For me it is all in the planning, rotation and knowing what is in your fridge, freezers and storage cupboards so that it gets used. It is simple kitchen management and what annoys me most is when someone takes something from the fridge and then puts it back unwrapped (if already wrapped and not in the same place it was taken from) It might sound like a case of OCD but for me it is about sound management. Ask any good professional chef and he would agree. The public needs to up its game on many fronts and our supermarkets need to change its policies with regards to what it sees as acceptable standards. Rant over… any comments are welcome. I am obviously feeling quite verbose tonight (or moderately inebriated ) , but I find , from my limited experience that schools do not teach food education , sustainable production methods or food sense. Considering that it is vital to life and health , and can have a huge effect on the unsustainable health costs that bad diet will bring us in the very near future , schools pay lip service to food and eating. I can still taste the cinnamon biscuits that my son made when he was 14 (truly a gastronomic experience that everyone should have once , and hopefully only once) but I see no evidence of any education around anything else relating to good diet , sustainable production or the true cost of food. Why break a habit of a lifetime of verbosity… I too have some memories of my daughters culinary conquests for which I am in no hurry to try again. I actually teach a group of Year 10 students annually to complete a simple boning of a chicken and next year they will also have to gut and fillet a trout before eating both communally over lunch. Dim Sum would be most welcome and perhaps we could get young Mr B to join us? If I may be so bold add to comment on your piece? Supermarkets are incredibly good at 2 things , making us believe that their goods are what we want and actually supplying us with what we want , or , think that we want. Having experience of supermarket supply chains ,I know that they will move nothing that does not make a profit. If supermarkets do not sell misshapen vegetables and bruised fruit it is because we will not buy it. Whilst not wishing to believe that I have the panacea to the problem of food waste ,I would posit that even a rudimentary education in food and cookery for our young folk would be the best way to actually revolutionise our approach to food and stop this sinful waste. Maybe we should teach food technology (or if I am being less politically correct , Home Economics ) in schools again? I totally agree Paul – our children today generally have little concept where their food comes from and how it is produced. Food tech is taught (alas not to all past Yr 9 I do believe) and the curriculum is changing but all too slowly and with so much pressure from the big retailers on our producers of food it will need a big sea change to really alter. Perhaps if the public were given choice of a “parsnip” or whatever that is rejected by the supermarket at a cheaper price I know which i would choose! Thanks for the comment and I hope we can meet up soon – it has been far too long! So agree with you, also why does everything come wrapped in plastic bags, I might only want one Apple, not a bag full, and don’t get me going on bananas wrapped in plastic. WHY. They have their own protective covering. I totally agree… about time there were big changes!